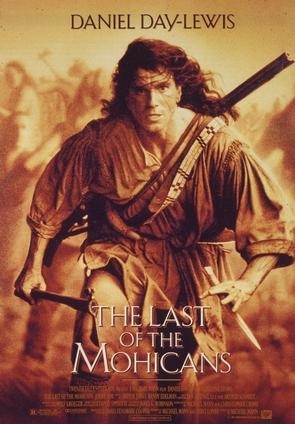 The Last of the Mohicans is the one of the best movies I've ever seen. It is set on the North American continent during the Eighteenth century, when the Europeans had arrived and set up colonies. The opposing forces of the English and the French were fighting for control of the land. Three Mohicans attempt to lead the daughters of an English colonel to safety as the war burns the world around them. It's an imaginatively shot, intelligently written, intricately plotted, intensely violent, inimitably acted, incredibly gripping historical drama that cannot fail to move you. It doesn't stint on the cost of war or the strength of love. The movie contains one of the most famous scenes in all romantic cinema, the waterfall scene (see the about page for more). The Last of the Mohicans was directed by Michael Mann, who appears to be physically incapable of directing a bad movie, and stars Daniel Day-Lewis who is awarded fewer Oscars than he deserves. All the actors are on top form, particularly Madeleine Stowe, who is in another of my all-time favourites (Twelve Monkeys) and is completely underrated. I love this movie! If you like it too, please consider joining.